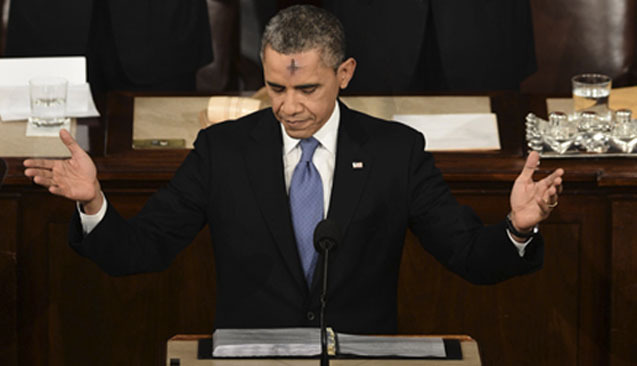 President Barack Obama started Ash Wednesday, 2015, with an announcement: using his presidential powers, he would fully give up on sabering Christians and destroying Jesus for Lent. Insiders who were called into the special presidential session were able to snap images of a very calm Obama, who had ash ‘smeared upon his forehead and kept speaking of destiny’, according to several different sources who leaked the information. Onlookers were shocked as Obama’s usually ‘Civil-Rights preacher’ style of inspirational speaker had given way to an ‘aggressive, determined voice that some say was reminiscent of Rasputin’. No matter the case, Christians should beware Obama’s policies over the coming weeks. This declaration he made before a closed session of who he thought were his close friends, but fortunately this information was leaked into the public. Obama’s speech was rife with ‘winks’ and smirks, indicating that he indeed does not plan to stop his agenda to destroy Jesus and reign in a new age of liberal darkness. This speech was aimed to let the word ‘leak’ that he plans to finally be fair to Republican Christians in America, the moral majority, and not just be a president for the liberals who believe in wanton carnality.